Charles "Chuck" Henderson Michaux, Jr.
Charles “Chuck” Henderson Michaux, Jr., 85, died Saturday March 30, 2019. 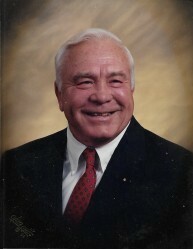 Chuck was the son of the late Charles Henderson and Jessie Lee Humphries Michaux, Sr. He was a member of St. David’s Church. Chuck is survived by his wife of 64 years, Margaret “Peggy” Miller Michaux, sons Charles (Kim) Michaux, III of Greensboro, NC, John (Donna) Michaux of Oak Island, NC, Ron Michaux of Summerfield, NC, seven grandchildren, and four great grandchildren. A graveside memorial service will be held at 3:00 P. M. Tuesday, April 2, 2019 at Old St. David’s Cemetery, Cheraw, SC. In lieu of flowers, memorials may be sent to: Nancy’s Kids, 40 Lynn Ave, Cheraw, SC 29520, or Mercy in Me Medical Clinic, 32 Foundery Hill Rd., Cheraw, SC 29520.